Right now, Photokina is happening in Cologne. 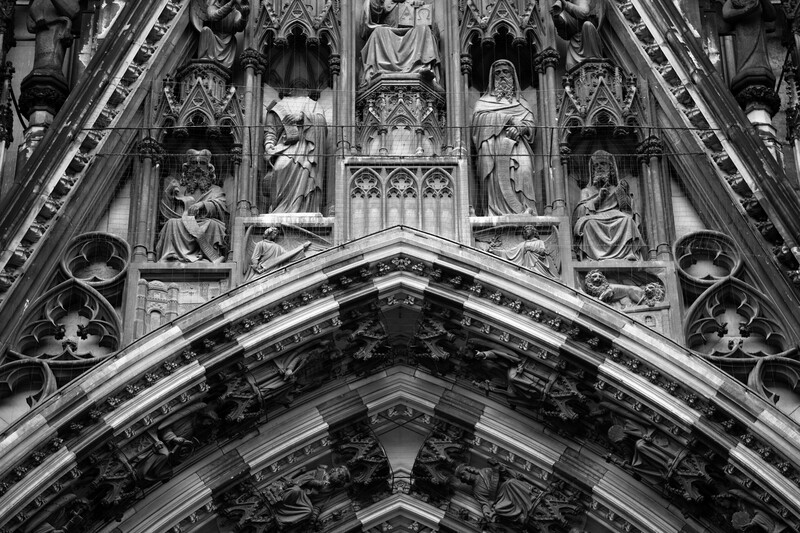 Detail of the Cologne Cathedral. Panasonic, as rumoured, announced the Lumix S, a full frame mirrorless camera using the “L-Mount”. L-mount is the mount from the Leica mirrorless Leica SL (not the M rangefinder) and is the result an alliance between Panasonic, Sigma and Leica. This is not Panasonic abandoning the M4/3 format. Panasonic has announced it is developing two full frame mirrorless cameras: the 47MP S1R and the 24MP S1. Both will be built around Leica’s L mount, allowing their use with existing Leica lenses as well as lenses promised by both Panasonic and Sigma. Alongside the two cameras, Panasonic has announced it will introduce three lenses: a 50mm F1.4, a 24-105mm zoom and a 70-200mm 2.8. It has also said it will introduce more than ten lenses before the end of 2020. These, in addition to the existing (expensive) Leica lenses available for the Leica SL. Unlike the GH5, the S1 and S1R cameras don’t have a flip out screen. It does video in 4K60P with no indication whether it is cropped or not, in body image stabilisation, two card slots (one XQD, one SD). Currently the performance and image quality is unknown. The camera is definitely aimed at the professional market as Panasonic introduce “pro-level service” for the cameras. Availability is scheduled to be early 2019, with no pricing disclosed yet. Will Olympus be joining the game later?